Ishasha Wilderness Camp is located within the southern Ishasha section of Queen Elizabeth National park adjacent to Ntungwe River. It’s a famous habitat for the tree climbing lions. It is the only lavish camp in the Ishasha section. 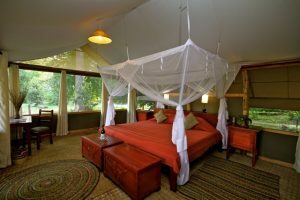 A luxury, eco-friendly camp, Ishasha Wilderness camp is well designed with luxury tents, in the African style, that are fully self contained. It is an idyllic retreat for those travelers who truly enjoy the wilderness. Being within the park, wildlife freely passes through the camp. Elephants can be seen bathing in the river, buffalo enjoy grazing and resident troops of Black-and-White Colobus and vervet monkeys are frequently viewed. *Solar power for lighting as well as charging simple gadgets. *Camp fire place to keep you warm all night.